"I can guarantee that we'll come out with the same effort tomorrow night. That's all I can guarantee. We'll give it all we've got, and from there I can't predict anything; but I can guarantee our effort." That was what star Warrior Chris Ray had to say after game two. I watched game three and I can tell you they came out with the same incredible effort. They definitely gave all they had. But Western was just better. Game three was a perfect example of the 2010-11 Western Mustangs. Talent-wise, they are the best team in the OUA West. It’s not really close this season. They have the best goaltending, they have a defence that is as good as anyone’s and their offence has proven to be incredibly deep. And that’s what gave them the series over Waterloo. Like Ray said, Waterloo gave it all they had. And it showed in the first period. It couldn’t have been more even. “I thought that first period was very intense and strategic. We were fortunate to get the win here,” Mustangs coach Clarke Singer said. With all due respect, fortune wasn’t a part of this win. The difference was, when Western turns it on and plays to their potential, they are unstoppable. It’s a shame that they only do it in small spurts, but when they do, look out. Three big spurts killed the Warriors in this series. In game one, Western scored four goals in a 12 minute span. From four different players I might add. On Sunday in the deciding game, a five minute span early in the second period lead to three goals. And Waterloo was crushed. They never really got back into it and Western just wore them down mentally and physically. A single minute in the third resulted in another three goals effectively sealing Waterloo’s fate. And I will continue to stress this point – that’s six goals from six different goal scorers. This may be the strangest analogy I’ve ever used, but they play the game a little like Muhammad Ali. You think you have some hope to win. And you will get some chances. But they will just shut the door on you. It’s frustrating, and suffocating. “I don’t feel our guys ever quit, but honestly, the two or three good shots we had, [Anthony] Grieco handled it well and took any momentum away when we couldn’t sneak one past him,” Warrior coach Brian Bourque said. And suddenly, almost out of nowhere, they build a little offensive momentum. They may get a small break, such as a turnover, or in the case of game three, a powerplay. And then they strike – hard, fast and repeatedly. They have made a living on scoring in bunches – it happens because a line will score, and the next line on is able to keep that offensive momentum and add to a lead. How on earth do you beat that? Well, that’s what Guelph has to figure out. So with that in mind, let’s take a peek at the OUA West final. Offence: The Gryphons were pretty poor offensively most of the season. But they have been on for about a month and a half. Let’s put it into perspective. Their highest point-getter in the regular season was Thomas Kiriakou, who was 25th in the OUA. In the playoffs, they have Edward Gale, Justin Gvora and Kris Belan in the top 11. Gale has scored some pretty crucial goals too, as each of his have been the first goal of the game or a game-winner. The Mustangs have been all about depth. They have five guys who have been point-a-game players and eight with at least four points. The beauty of it is they haven’t had to rely on all-stars Keaton Turkiewicz or Kevin Baker because guys like Chris Corbeil, Josh McQuade and Steve Reese have been getting the job done offensively. Advantage: In the playoffs, depth matters. A lot. Point Western. Defence: Well, the first aspect of defence is keeping the puck out of your net. 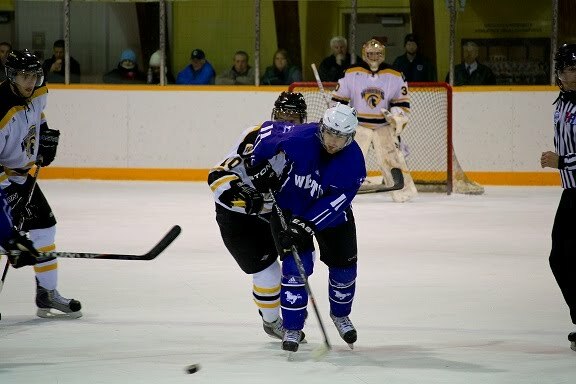 Western has allowed only seven goals in five games. That’s 1.4 per game. Guelph has allowed just under three a game. On the other hand, Guelph has only allowed 22.5 shots per game, while Western has conceded 30. Finally, Guelph’s defensive corps has contributed eight points, while Western’s has added a total of 10. Advantage: It’s pretty close to call. Guelph is punished by poor goaltending, but Western’s D adds more to offence, especially on the powerplay. Let’s call this a tie. Goaltending: Here is the biggest advantage of the series. Let’s just consider a few numbers. Anthony Grieco is 4-1 in the playoffs, has a .953 save percentage, and a 1.40 goals against average. His playoff opponents, Windsor and Waterloo, previously scored 2.7 and 3.1 goals a game respectively during the regular season. Andrew Loverock is 4-2, has a .896 save percentage and a 2.34 goals against average. His opposition (Brock and Laurier) previously scored 2.9 and 3.3 goals a game during the season. Loverock may have faced better offences, but Grieco is clearly far superior. Grieco is also just continuing what he has done all year. That’s about all he has in common with his Gryphon counterpart, who hasn’t been much better than he was during the regular season. Special thanks to Chester Yang of Imprint and Greg Colgan of the Gazette for acquiring those quotes.